By far, the most popular post on this blog has been my discussion on the various protocol efficiencies between native 8 Gb/s Fibre Channel and 10 Gb/s Ethernet using Fibre Channel over Ethernet encapsulation. I wrote the original post as much as an exercise in the logic as it was an attempt to educate. I find that if I can’t explain a subject well, I don’t yet understand it. Well, as it’s been pointed out in the comments of that post, there were some things that I missed or just had simply wrong. That’s cool – so let’s take another stab at this. While I may have been wrong on a few points, the original premise still stands – on a per Gb/s basis, 10Gb FCoE is still more efficient than 8Gb FC. In fact, it’s even better than I’d originally contended. One of the mistakes I made in my original post was to start throwing around numbers without setting any sort of baseline for comparison. Technology vendors have played slight-of-hand games with units of measure and data rates for years – think of how hard drive manufacturers prefer to define a megabyte (1 million bytes) versus how the rest of the world define[d] a megabyte (2^20 bytes or 1,048,576 bytes). It’s important that if we’re going to compare the speed of two different network technologies, we establish where we’re taking the measurement. Is it, as with 10GE, measured as bandwidth available at the MAC layer (in other words, after encoding overhead), or as I perhaps erroneously did with FC, measuring it at the physical layer (in other words, before encoding overhead). I also incorrectly stated, unequivocally, that 10GE used 64/66b encoding, when in fact 10GE can use 8b/10b, 64b/66b, or other encoding mechanisms – what’s important is not what is used at the physical layer, but rather what is available at the MAC layer. In the case of 10GE, 10Gb/s is available at the MAC layer, regardless of the encoding mechanism, transceivers, etc used at the physical layer. The Fibre Channel physical layer, on the other hand, sets its targets in terms of MB/s available to the Fibre Channel protocol (FC-2 and above). This is the logical equivalent of Ethernet’s MAC layer – after any encoding overhead. 1Gb Fibre Channel (hereafter FC), as the story goes, was designed to provide a usable data rate of 100 MB/s. If we’re truly going to take an objective look at the two protocols and how much bandwidth they provide at MAC (or equivalent) and above, we have to pick one method and stick with it. Since the subject is storage-focus (and frankly, most of the objections come from storage folks), let’s agree to use the storage method – measuring in MB/s available to the protocol. As long as we use that measurement, any differences in encoding mechanism becomes moot. So back to 1Gb/s FC, with it’s usable data rate of 100 MB/s. The underlying physical layer of 1Gb/s FC uses a 1.0625 Gb/s data rate, along with 8b/10b encoding. Now, this is where most of the confusion and debate seems to have crept into the conversation. I’ve been attacked by a number of folks (not on this site) for suggesting that 1Gb FC has a 20% encoding overhead, dismissing it as long-standing FUD – created by whom and for what purpose, I’ve yet to discover. No matter how you slice it, a 1.0625 Gb/s physical layer using 8b/10b encoding results in 0.85 Gb/s available to the next layer – in this case, FC-2. Conveniently enough, as there are 8 bits in a byte, 100MB/s can be achieved over a link providing approximately 800Mb/s, or 0.8Gb/s. Now, who doesn’t like nice round numbers? Who cares what the underlying physical layer is doing, as long as it meets your needs/requirements/targets at the next layer up? If the goal is 100MB/s, 1Gb/s FC absolutely meets it. Does 1Gb/s FC have a 20% encoding overhead? Yes. Is that FUD? No. Do we care? Not really. As each generation of FC was released, the same physical layer was multiplied, without changing the encoding mechanism. So 8Gb/s FC is eight times as fast as 1Gb/s FC. The math is pretty simple : ( 1.0625 * 8 ) * 0.8 = 6.8 Gb/s available to the next layer. Before my storage folks (by the way – my background is storage, not Ethernet) cry foul, let’s look at what 6.8 Gb/s provides in terms of MB/s. A quick check of Google Calculator tells me that 6.8 Gb/s is 870 MB/s – well over the 800 MB/s we’d need if we were looking to maintain the same target of 100MB/s per 1 Gb/s of link. So again, who cares that there’s a 20% encoding overhead? If you’re meeting your target, it doesn’t matter. Normalized per Gb/s, that’s about 108 MB/s for every Gb/s of link speed. At this point, you’re probably thinking – if we don’t care, why are you writing this? Well, in a converged network, I don’t really care what the historical target was for a particular protocol or link speed. I care about what I can use. Given my newly discovered understanding of 10Gb Ethernet, and how it provides 10 Gb/s to the MAC layer, you can already see the difference. At the MAC layer or equivalent, 10GE provides 10Gb/s, or 1,280MB/s. 8G FC provides 6.8Gb/s, or 870MB/s. For the Fibre Channel protocol, native FC requires no additional overhead, while FCoE does require that the native FC frame (2148 bytes, maximum) be encapsulated to traverse an Ethernet MAC layer. This creates a total frame size of 2188 bytes maximum, which is about a 2% overhead incurred by FCoE as compared to native FC. Assuming that the full bandwidth of a 10Gb Ethernet link was being used to carry Fibre Channel protocol, we’re looking at an effective bandwidth of (1280MB/s * .98) = 1254Mb/s. Normalized per Gb/s, that’s about 125 MB/s for every Gb/s of link speed. The whole idea of FCoE was not to replace traditional FC. It was to provide a single network that can carry any kind of traffic – storage, application, etc, without needing to have protocol-specific adapters, cabling, switching, etc. Given that VERY few servers will ever utilize 8Gb/s of Fibre Channel bandwidth (regardless of how or where you measure it), why on earth would you invest in that much bandwidth and the cables, HBAs, and switches to support it? Why wouldn’t you look for a solution where you have burst capabilities that meet (or in this case, exceed) any possible expectation you have, while providing flexibility to handle other protocols? I don’t see traditional FC disappearing any time soon – but I do think its days are numbered at the access layer. Sure, there are niche server cases that will need lots of dedicated storage bandwidth, but the vast majority of servers will be better served by a flexible topology that provides better efficiencies in moving data around the data center. Even at the storage arrays themselves, why wouldn’t I use 10GE FCoE (1254 MB/s usable) instead of 8Gb FC (870 MB/s usable)? Now, when 16Gb FC hits the market, it will be using 64/66b encoding. The odd thing, however, is that based on the data I’ve turned up from FCIA, it’s actually only going to be using a line-rate of 14.025 Gb/s, and after encoding overheads, etc, supplying 1600 MB/s usable (though my math shows it to be more like 1700 MB/s) – in keeping with the 1Gb/s = 100MB/s target that FC has maintained since inception. Sometime after 16Gb FC is released, will come 40GE, followed by 32Gb FC, and again followed by 100GE. It’s clear that these technologies will continue to leapfrog each other for some time. My only question is, why would you continue to invest in a protocol-specific architecture, when you can instead have a flexible one? Even if you want the isolation of physically separate networks (and there’s still justification for that), why not use the one that’s demonstrably more efficient? FCoE hasn’t yet reached feature parity with FC – there’s no dispute there. It will, and when it does, I just can’t fathom keeping legacy FC around as a physical layer. The protocol is rock solid – I can’t see it disappearing the foreseeable future. The biggest benefits to FCoE come at the access layer, and we have all the features we need there today. If you’d like to post a comment, all I ask is that you keep it professional. If you want to challenge my numbers, please, by all means do so – but please provide your math, references for your numbers, and make sure you compare both sides. Simply stating that one side or the other has characteristic X doesn’t help the discussion, nor does it help me or my readers learn if I’m in error. Strange as it may seem with all of the great new features in UCSM 1.4, this is one of my favorites. To understand the impact, first look at the way disruptive changes were handled prior to this release. When changing a configuration setting on a service profile, updating service profile template, or many policies, if the change would cause a disruption to running service profiles (i.e. requiring a reboot), you had two options : yes, or no. When modifying a single profile, this wasn’t a big issue. You could simply change the configuration when you were also ready to accommodate a reboot of that particular profile. Where it became troublesome was when you wanted to modify an updating service profile or policy that affected many service profiles – your choice was really only to reboot them all simultaneously, or modify each individually. Obviously for large deployments using templates and policies (the real strength of UCS), this wasn’t ideal. A policy of “Immediate” means that when a disruptive change is made, the affected service profiles are immediately rebooted without confirmation. A normal “soft” reboot occurs, whereby a standard ACPI power-button press is sent to the physical compute node – assuming that the operating system traps for this, the OS should gracefully shut down and the node will reboot. When this option is selected, disruptive changes are staged to each affected service profile, but the profile is not immediately rebooted. Instead, each profile will show the pending changes in its status field, and will wait for the administrator to manually acknowledge the changes when it is acceptable to reboot the node. The most interesting new option is the is the “timer-automatic” setting. This setting allows the maintenance policy to reference another new object, the Schedule. The only schedule created automatically by UCSM is the “default” schedule, which has one recurring entry to reboot all service profiles that reference a “timed-automatic” maintenance policy associated with the “default” schedule each day at midnight. This “default” schedule can be modified, of course. Creating a user-defined schedule provides the ability to control when – and how many – profiles are rebooted to apply disruptive changes. The One Time Occurrence option sets a single date and time when this schedule will be in effect. For example, if you wanted all affected profiles to be rebooted on January 18th at midnight, you could create an entry such as the following. Once the date and time have been selected, the other options for the occurrence can be selected. Max Duration specifies how long this occurrence can run. Based on the other options selected below it, it is possible that all service profiles may not be able to be rebooted in the time allotted. If this is the case, changes to those profiles will not take effect. Max Number Of Tasks specifies how many total profiles could be rebooted by this occurrence. Max Number Of Concurrent Tasks controls how many profiles can be rebooted simultaneously. If, for example, this schedule will be used on a large cluster of service profiles where workload can be sustained even while 5 nodes are unavailable, set this value to 5 and the reboots will occur in groups of that size. Minimum Internal Between Tasks allows you to set a delay between each reboot. This can be set to ensure that each node rebooted is given time to fully boot before the next node is taken down. The Recurring Occurrence option provides for the creation of a schedule that will run every day, or on a specific day, to apply disruptive changes. This option has the same per-task options as the previous example. Once you have created your maintenance policy and schedule (if necessary), the service profile or service profile template must reference the maintenance policy in order for it to have any effect. After selecting your service profile or template, the Actions window has an option to Change Maintenance Policy. You may then select the Maintenance Policy you wish to use, or create a new one. The service profile properties will now show that a maintenance policy has been selected. In this example, a policy requiring user acknowledgement has been chosen. Now if any disruptive changes are made, the service profile will not reset until manually acknowledged by an administrator. Any time profiles are awaiting acknowledgement, a warning “Pending Activities” will be shown on the UCSM status bar. Within the profile properties, a description of the pending changes will be displayed along with the “Reboot Now” option. I hope this description of the new maintenance policies and schedules options was helpful. 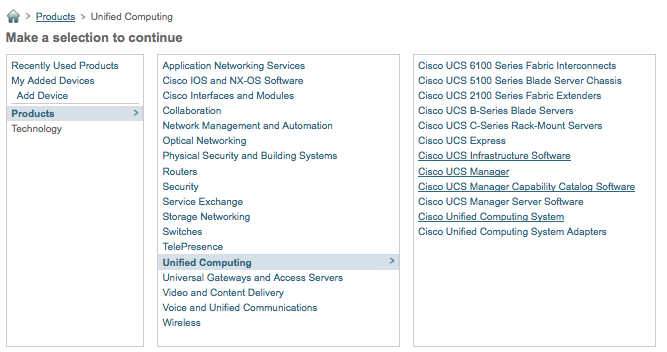 I’m very excited by all the new features rolling into UCS – it was a great system before, and it’s only getting better! After upgrading one of my lab systems to 1.4(1i) (released December 20, 2010), all of the fans in my chassis showed as failed. Since each fan module contains two separately monitored fans, this resulted in 24 total warnings in my system (8 x fan module, 16 x fans) – annoying, but cosmetic only. UCSM 1.4(1j) was released just a few weeks later (January 7, 2011) with a number of small bug fixes listed in the release notes, but nothing about my fan issue. However, after updating my IO Modules to the new 1.4(1j) code, the errors disappeared. This makes sense, since the IO Modules contain the Chassis Management Controller which is responsible for monitoring all of the chassis components. So, thanks to Cisco for fixing this small but annoying bug! Prior to UCSM 1.4, all UCS firmware was delivered as a single bundle – this included UCSM itself, the code for the Fabric Interconnects, IO Modules, blades, mezzanine cards, etc. With UCSM 1.4, code is now delivered in three different packages. This makes it easier for Cisco to release support for new blades, mezzanine cards, etc, without having to release a new version of UCSM. The three new categories are “Cisco UCS Infrastructure Software”, “Cisco UCS Manager Server Software”, and “Cisco UCS Manager Capability Catalog Software”. The “Infrastructure Software” category contains UCSM, and the firmware/software for the Fabric Interconnects, IO Modules, and FEX modules (for C-series attachment). 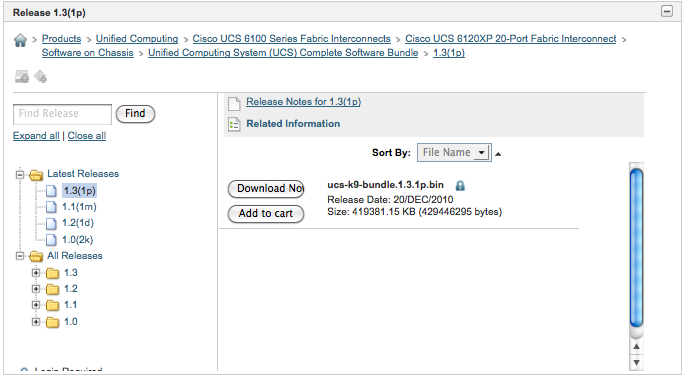 “Cisco UCS Manager Server Software” has two sub-categories, one for B-series blades and one for C-series rack-mount servers. Finally, the “UCS Manager Capability Catalog Software” category contains a small file that describes (to UCSM) all of the components of a UCS system for inventory, categorization, etc. If Cisco were to release, say, new fan modules that had different specifications than the existing ones, only this file would need to be updated instead of a full system-wide upgrade. I hope this helps when going looking for the latest code for your UCS system! Ok, so this one isn’t earth-shattering, but I thought it was worth mentioning. Previous to UCSM 1.4, the only way to transfer bundles of firmware to UCSM was via an external server – FTP, TFTP, SCP, or SFTP. In most shops, this isn’t a big deal – you likely already have a utility server of some type available on your management network(s) for other similar tasks. In some scenarios (especially greenfield deployments), though, you may not have ready access to such a server or for other reasons may not want to put your UCS code there. or use the traditional method transferring the file from a remote server. Again, not a huge deal, but definitely a nice convenience enhancement. UCSM 1.4 : Direct attach appliance/storage ports! One of the most often requested features in the early days of UCS was the ability to directly attach 10GE storage devices (both Ethernet and FCoE based) to the UCS Fabric Interconnects. Up until UCSM 1.4, only two types of Ethernet port configurations existed in UCS – Server Ports (those connected to IO Modules in the chassis) and Uplink Ports (those connected to the upstream Ethernet switches). As UCS treated all Uplink ports equally, you could not in a supported manner connect an end device such as a storage array or server to those ports. There were, of course, clever customers who found ways to do it – but it wasn’t the “right” or most optimal way to do it. Especially within the SMB market, many customers may not have existing 10G Ethernet infrastructures outside of UCS, or FC switches to connect storage to. For these customers, UCS could often provide a “data center in a box”, with the exception of storage connectivity. For Ethernet-based storage, all storage arrays had to be connected to some external Ethernet switch, while FC arrays had to be connected to a FC switch. Adding a 10G Ethernet or FC switch just for a few ports didn’t make a lot of financial sense, especially if those customers didn’t have any additional need for those devices beyond UCS. With UCSM 1.4, all of that changes. Of course, the previous method of connecting to upstream Ethernet and FC switches still exists, and will still be the proper topology for many customers. Now, however, a new set of options has been opened. New in 1.4 are the Appliance, FCoE Storage, Monitoring Ethernet, Monitoring FC, and Storage FC port types. I’ll cover the Monitoring types in a later post. On the Ethernet side of things, the Appliance and FCoE Storage allow for the direct connection of Ethernet storage devices to the Fabric Interconnects. The Appliance port is intended for connecting Ethernet-based storage arrays (such as those serving iSCSI or NFS services) directly to the Fabric Interconnect. If you recall from previous posts, in the default deployment mode (Ethernet Host Virtualizer), UCS selected one Uplink port to accept all broadcast and multicast traffic from the upstream switches. By adding this Appliance port type, you can ensure that any port configured as an Appliance Port will not be selected to receive broadcast/multicast traffic from the Ethernet fabric, as well as providing the ability to configure VLAN support on the port independently of the other Uplink ports. The FCoE Storage Port type provides similar functionality as the Appliance Port type, while extending FCoE protocol support beyond the Fabric Interconnect. Note that this is not intended for an FCoE connection to another FCF (FCoE Forwarder) such as a Nexus 5000. Only direct connection of FCoE storage devices (such as those produced by NetApp and EMC) are supported. When an Ethernet port is configured as an FCoE Storage Port, traffic is expected to arrive without a VLAN tag. The Ethernet headers will be stripped away and a VSAN tag will be added to the FC frame. Much as the previous FC port configuration was, only one VSAN is supported per FCoE Storage Port. Think of these ports like an Ethernet “access” port – the traffic is expected to arrive un-tagged, and the switching device (in this case, the Fabric Interconnect) will tag the frames with a VSAN to keep track of it internally. When the frames are eventually delivered to the destination (typically the CNA on the blade), the VSAN tag will be removed before delivery. Again, it’s very similar to traffic flowing through a traditional Ethernet switch, access port to access port. Even though both the sending and receiving devices are expecting un-tagged traffic, it’s still tagged internally within the switch while in transit. The Storage FC Port type allows for the direct attachment of a FC storage device to one of the native FC ports on the Fabric Interconnect expansion modules. Like the FCoE Storage Port type, the FC frames arriving on these ports are expected to be un-tagged – so no connection to an MDS FC switch, etc. Each Storage FC Port is assigned a VSAN number to keep the traffic separated within the UCS Unified Fabric. When used in this way, the Fabric Interconnect is not providing any FC zoning configuration capabilities – all devices within a particular VSAN will be allowed, at least at the FC switching layer (FC2), to communicate with each other. The expectation is that the devices themselves, through techniques such as LUN Masking, etc, will provide the access control. This is acceptable for small implementations, but does not scale well for larger or more enterprise-like configurations. In those situations, an external FC switch should be used either for connectivity or to provide zoning information – the so-called “hybrid model”. I’ll cover the hybrid model in a later post. Posted on December 31, 2010 Author daveCategories UCS Hardware, UCS Management ToolsTags 1.4, fc, fcoe, iscsi, nas, nfs, storage, ucsm30 Comments on UCSM 1.4 : Direct attach appliance/storage ports! What’s cool in UCSM 1.4? Instead I thought it might be useful, especially for those new to UCS, to do a series of posts on the new features (there’s a ton of them!) and what they really mean to an existing or potential UCS shop. I’m really excited by this release, as there are so many cool new things that really cement UCS as a top-notch architecture. So many of my wish-list items have been fulfilled by this release. Many of the features I’ve heard customers asking for have been delivered in 1.4, so I’m sure this upgrade is going to make a lot of people very happy. So, I have a handful of features that I plan to detail over the next few days and weeks, but I’d like to know – what features are you most curious about? What features perhaps do you not see the value of? Your comments will help me prioritize my posts! Posted on December 31, 2010 Author daveCategories UCS Management ToolsTags 1.4, balboa, ucsm2 Comments on What’s cool in UCSM 1.4? During a discussion recently with some other UCS-savvy folks, I realized that there may be some confusion in how to place mezzanine adapters in full width blades when you’re only using one adapter. First, a quick review of how UCS pins mezzanine ports to uplinks. I’ll skip the one uplink option, since all ports use the single uplink. In a two-uplink configuration, all odd numbered slots use uplink #1, while all even numbered slots use uplink #2. (Easy to remember – odds go to the odd uplink, evens go to the even uplnk). Since a full-width blade occupies two horizontally adjacent slots, each full width blade will contain both an even and an odd numbered mezzanine slot. Let’s look at the slot numbering – this diagram shows half width blades. Consider the case of 4 full width blades, all with a single mezzanine card in the “left” (as viewed from the front) slot. In a two-uplink configuration, only the first uplink would be used – since all odd numbered slots are pinned to uplink #1. Uplink #2 would be completely unused. Consider the same previous example. In the four-uplink configuration, only uplinks 1 and 3 are used, as these are the uplinks pinned to the odd-numbered mezzanine slots. Uplinks 2 and 4 would remain idle. When using full width blades and single mezzanine cards, it’s important to consider the other blades in the chassis when selecting where to install the mezzanine card. Individual configurations will vary, depending on the number of half and full width blades in use. If using all full width blades with single mezzanine cards, two of the blades should have the mezzanine card in the left slot and two blades should have the mezzanine card in the right slot. By properly selecting the mezzanine placement, such as first blade (slots 1 and 2) in the left (1) position, the second blade (slots 3 and 4) in the left (3) position, third blade (slots 5 and 6) in the right (6) position, and the fourth blade (slots 7 and 8) in the right (8) position, you achieve proper usage of all four uplinks. The inverse is also functionally identical, populating mezzanine slots 2, 4, 5, 7. For a two-uplink configuration, any combination of mezzanine layout is acceptable as long as two blades have mezzanine cards in the left slots, and two have mezzanine cards in the right slots. If beginning with a two-uplink configuration, it would be wise to use the four-uplink layout to minimize future reconfiguration if expanding to four uplinks. Cisco UCS provides a configurable “Chassis Discovery Policy” that affects how chassis links (called “Server Ports”) are activated when discovering a new chassis. See this page on cisco.com. After a recent discussion on Twitter, I decided to test out a few scenarios. My configuration is a pair of UCS 6120 Fabric Interconnects, two UCS 5108 Chassis, with 2 links per IO Module. Additionally, this particular lab is on a reasonably old version of UCSM code, 1.0(1f). I’m not in a position to upgrade it at the moment – I can re-test at a later date with more current code. I don’t expect the behavior to change, however. I started with the default discovery policy of 1-link. I enabled one link per fabric interconnect to a chassis, and checked the status of the ports. The ports were in an “Up” Overall Status, which is proper – and means that the link is available for use. I then enabled a second link per fabric interconnect to the same chassis. The second activated link went into a “Link Up” state, with “Additional info” of “FEX not configured”. This means that the physical link has been activated, but is not in use – the IO Module (FEX) is not using the link. A re-acknowledgement of the chassis activates the second link. I then changed the discovery policy to 4-links. I enabled one link per fabric interconnect to a different chassis, and checked the status of the ports. The ports went into the “Link Up” state, “FEX Not Configured” – in other words, the links are not use. While we can detect that the chassis is present, no traffic will flow as the FEX has not yet been configured to pass traffic. Furthermore, the chassis is an error state, in as much as the cabling doesn’t match the chassis discovery policy. Reacknowledging the chassis activates the links, and removes the error condition, even without changing the discovery policy. Finally, I tested the scenario of setting the chassis discovery policy to 2 links and activating only one link per Fabric Interconnect. As expected, the link enters the “link-up”, “FEX not configured” state. I then activated a second link per Fabric Interconnect. After a brief period, both ports per Fabric Interconnect enter the “Up” status. In short, setting the Chassis Discovery Policy determines how many links must be present per Fabric Interconnect to an IO Module before the ports are activated and the chassis is put into service. If the policy is set at 1 link, and more than 1 link are activated, a simple re-acknowledgement of the chassis will activate the additional links. If the policy is set to a higher number – and that number of links are not present – the chassis will not be activated unless a manual re-acknowledgement is done. Frankly, I don’t see a lot of value in this feature – unless you’re adding a large number of chassis that will all have identical numbers of uplinks. Even then, you’re saving yourself at most a few clicks of the mouse to re-ack the chassis that don’t match the policy. Why not simply leave the policy at default and re-ack any chassis that has more than 1 link per IOM? Presumably you’re going to do this before actually deploying any service profiles, so there’s no potential for disruption with the re-ack.